I am a palaeontologist and taphonomist based in Brisbane, Queensland. I investigate the death, burial, and fossilisation of ancient animals including dinosaurs, crocodiles, and fish from the Mesozoic (the age of dinosaurs). I use information from the forensic sciences coupled with records of decay in modern animals to interpret how these fossils formed, and tease apart any evidence that might point to how they died and what environment they lived in. My most recent work involved uncovering the taphonomic history of ~102-100 million year old (upper Lower Cretaceous) crocodile, dinosaur, and fish fossils from the Winton Formation at Isisford, Queensland. These fossils are found in round boulder-like sandstone concretions, and so I also investigated how these concretions formed. I have previously worked on 61-56 million year old (Paleocene) shark and ray teeth fossils from the Boongerooda Greensand Formation in north-west Western Australia. 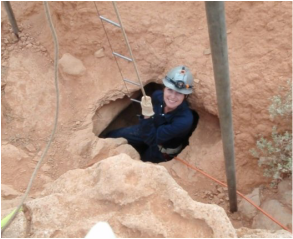 I've also volunteered on a couple of field expeditions to limestone caves in the Nullarbor Desert, and Alcoota Research Station in the Northern Territory. I can't remember a time when I wasn't interested in palaeontology. In fact, as I grew up on a farm in rural Western Australia, I was forever collecting and examining sheep skeletons (it was the closest I could get to real vertebrate fossils)! I was also starting to amass a pretty extensive library of palaeontology related text books. Archaeology is a close second passion to palaeontology, particularly the history of 14th century England, and if I had grown up in Europe then I think I'd be juggling two careers. The School of Biological Sciences, UQ, asked for post-grad students to blog about their research experiences (ups and downs), and I was more than happy to comply. I am now post-doctoral, and so will continue to write about life after the PhD. Happy reading! If you'd like to hear more about what taphonomy is, and what I research, then have a listen to this podcast interview by Smart Enough to Know Better.